Wolf Mountain Realty, Inc. is located in the area known as Wolf Laurel in Mars Hill, North Carolina. We are located in Madison County NC, which was created in 1851 and named after President James Madison. Marshall is the county seat of rural Madison County, which is now home to the Wolf Ridge Ski resort and Mars Hill College NC. Mars Hill is a charming historic town, with a long and colorful political past. It is certainly more than just a college town. 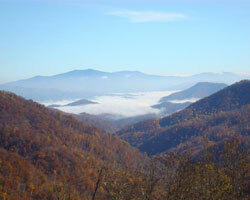 The area also boasts some of the most beautiful mountain scenery, and the Appalachian Trail cuts through Madison County. With every season comes new sights to see, fresh festivals to take part in, and various other things to do. In fact, Mars Hill is recognized for its traditional mountain music and crafts heritage. It hosts its annual Heritage Festival every fall, where the streets of downtown come alive with the celebration of mountain crafts, arts, clogging, and music. In addition, the Mars Hill has its fair share of shops and restaurants, offering something for everyone, the whole family can enjoy. With its small town ambiance, its peace and tranquility are enough to capture anyone’s heart. Mars Hill is wonderful place to escape to, whether for a day, weekend, or lifetime, and positively has its perks. Given the fact that while it seems to be off on its own, with even its own attractions in Mars Hill, it is just minutes from Asheville, the largest city in western NC. Residents and visitors have the best of both worlds. For more information and of course to view our Houses For Sale In Mars Hill NC, we invite you to look around our website. Wolf Mountain Realty specilizes in Madison County NC Real Estate offering Cabins Near Mars Hills NC and more. This area is a wonderful vacation destination and we also offer many great log cabin rentals, condominiums and more…all close to skiing, golf, hiking, biking, and much more. In order for you to make the most of your time spent here, below are a few listed sites to help you get acquainted with the area beforehand. From Madison County schools NC to Mars Hill NC weather, the information is available. We hope you enjoy your stay in Mars Hill and welcome you to contact us with any questions.